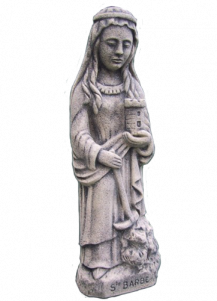 St Barbara had a father, Dioscorus, who kept her in a lonely tower. She gave, there, herself to prayer and received Baptism from a Christian priest. Discovering her convertion, her father became beside himself with rage and beheaded her. But speedily punished, Dioscorus has been struck with a flash of lightning. St Barbara is the patron saint for firemen.